Solvent-based, impregnating, colour-enhancing, stain-proof, and wet-look, non-filming treatment with matt finish for all compact surfaces with minimum absorption. DEEP ENHANCER is a solvent-based, impregnating, colour-enhancing, stain-proof and wet-look non-filming protective treatment to revive ultra-compact surfaces characterised by minimum absorption capacity. It is used to enhance the colour and tone of more compact materials such as ceramics, porcelain stoneware, quartz agglomerate and natural polished stones, adding a matt finish without creating a surface film. Compared to traditional wet-look colour enhancers that, when applied to compact surfaces leave a patina or surface residue, DEEP ENHANCER is also able to penetrate the least absorbent materials, creating a solution that is truly one of a kind. 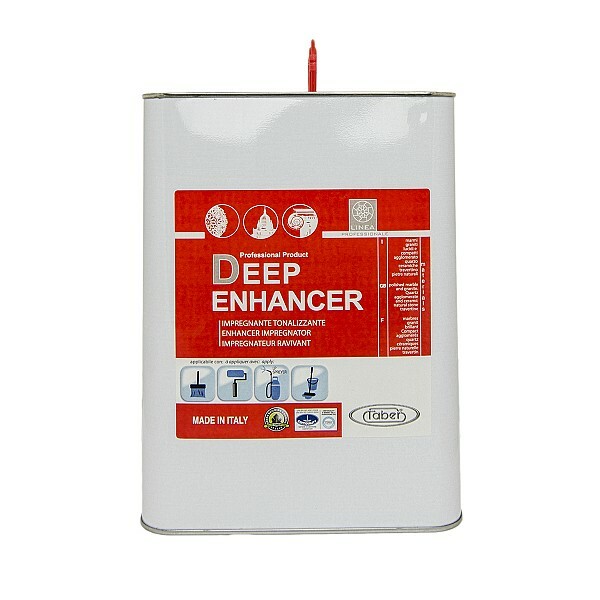 DEEP ENHANCER thanks to these characteristics, is specifically indicated to be used outdoors or on surfaces that due to their nature, need to withstand conditions with continued presence of water, such as showers, fountains and washbasins. It has a lasting effect, can withstand UV rays and the elements and will not yellow if exposed to sunlight. DEEP ENHANCER confers excellent water-repellent and stain-proof qualities to the surfaces to which it is applied, making daily cleaning and maintenance of treated surfaces easier. It is also certified for use with foods and therefore, it can be used as a stain-proof, colour-enhancing treatment on kitchen worktops. DEEP ENHANCER can be applied to natural stone with polished, brushed or brushed and flamed finish.